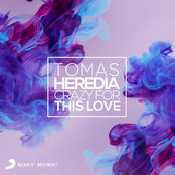 Tomas Heredia os presenta su tema dance "Crazy for This Love" que entra con fuerza en varias listas top en Argentina. Ahora puedes ver el video oficial del canal del cantante y ver su letra. The sun is burning in my face. Telling me: it's a brand new day. I will find you on my way. I gotta say I'm crazy for this love. Baby, I'm crazy for this love. When I'm with you, its a shine new brighter. I'm crazy for this love, and its all I have. I don't want to waste my time right now. I'm crazy for this love, baby one more time.